A geometric pattern can totally make a room. 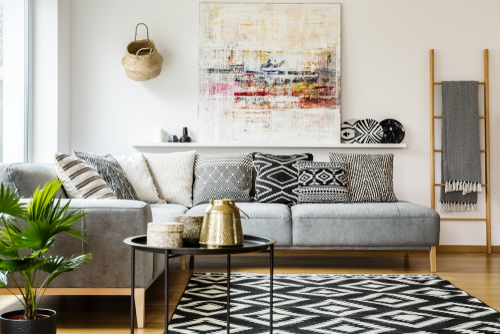 From rugs to sofa throws, lampshades to footstools, there are many soft furnishings and accessories that can bring geometric shapes to the forefront of a contemporary interior design. Add in a splash of colour as well and your room will be a real hit with guests. If your room has light walls and sofas, why not add in a brightly coloured zig zag rug or some large coloured geometric style planters. There’s no reason why you can’t go big with geometry in your home, and walls are the perfect place to add that touch into your design. Trellis, triangles, to lines in a bold or subtle way can add the geometric style feature wall. Think interesting colours, shapes and stripes. It’s a great way to add personality to your home plus why not use some clever plant containers on the walls as well, displaying plants that enhance the style, such as String of Hearts or String of Pearls. Many plants can be used to create geometric shapes, or planted in geometric pots to compliment your home. The Sansevieria (Snake Plant) is ideal in geometric pots as the tall long lines of foliage work perfectly and look great in modern interior design. Another great plant to use is the Boston Fern. It has superb texture and the foliage can hang over a sharp geometric lined pot to soften the look and bring some greenery into the room. It’s great to play with plants and there’s no denying they add a beautiful touch to the home. With Cacti and Succulents so popular at the moment, it has meant pots, planters and hangers have become available in new and exciting shapes and sizes. There are some wonderful geometric style pots and hanging containers available with patterns to compliment the home. From wired, crossover hangers for cacti to geometric, ceramic funky pots for succulents. The options are vast now so you can choose from many in your style to match your room. If you are thinking of using geometric shapes in your home, come along to visit us and take a look at the accessories and plants to compliment your ideas!